Fem Calm is a natural supplement that was formulated and marketed towards menopausal women. Fem Calm claims to be able to relieve the many discomforts that are often associated with the natural onset of menopause. The research that we conducted on Fem Calm provided us a good bit of insight into the product, which we shall share with you below. Vitamin B12– Vitamin B12 is used to treat chronic fatigue syndrome, aging, immune system problems and memory issues. Folate- This can help with bipolar disorder and memory loss. Chasteberry- Chasteberry has been shown to help with PMS and PMDD. Rhodiola Rosea– This is likely ineffective in the treatment of depression, fatigue and anxiety. vitamin b6- Has been shown to be ineffective in the treatment of PMS. 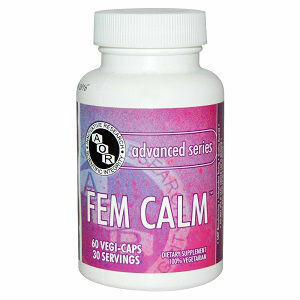 The recommended dosage for Fem Calm is 2 capsules daily. Despite our constant searching through all of the manufacturer’s web presence, we were unable to find any documentation for pricing of Fem Calm. We were unable to find any guarantee of any sort provided with Fem Calm, no matter how hard we looked. Fem Calm provides nothing to its consumers. Consumers have no clue how much it is going to cost them until they see the amount on their credit card statement. There is no guarantee provided, so the purchase is absolutely final. The ingredients listed are not proven to help with menopause, however they can be beneficial in some aspects of general health. Jackie Horowitz	reviewed Fem Calm	on March 9th	 and gave it a rating of 2.